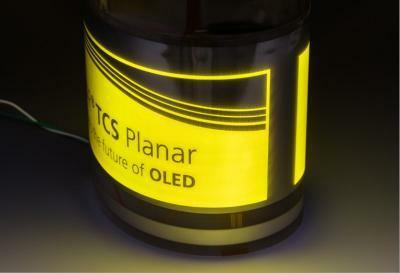 Fraunhofer FEP and Sefar developed a roll-to-roll processed large-area flexible OLED lighting panels in a joint project. This achievement followed a batch-based flexible OLED panel demonstrated in early 2017. The R2R process currently used enables Fraunhofer and Sefar to produce 30 cm wide OLEDs in lengths of up to 30 meters. The OLED panel is based on Sefar's TCS Planar substrate which is made in a R2R process. TCS Planar is a foil-like substrate that has a very high conductivity of up to 0.01 Ohm/Square and a transparency above 87%. The electrodes are made from metallic wires, each with a diameter of 40 µm.